Improving recycling quality is critical. Helping people to reduce contamination when sorting their waste is about clear, attractive communication and feeling good while they do it.These signs would be ideal at waste transfer centres.Our range of signs deliver clear messaging in a fun eye catching way. Click quote at the button of the page to grab our attention! 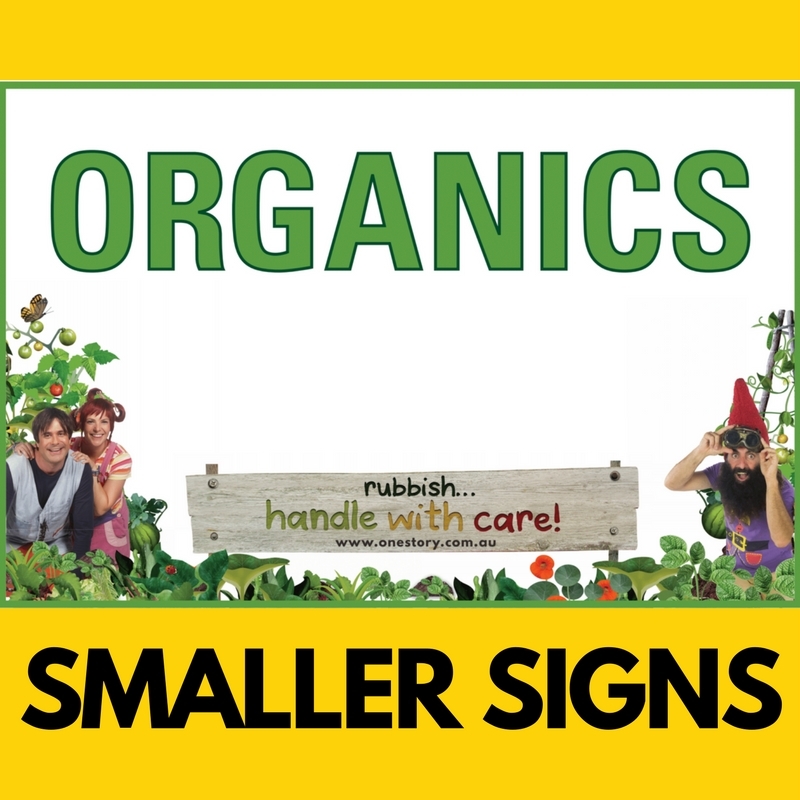 3 larger signs are available to direct people to the major categories of LANDFILL, ORGANICS and RECYCLING as well as a collection of smaller signs to cover many of the individual recycling components you may have. We have also included an additional selection of helpful signage plus a few positive messages to help everyone feel good while getting sorted. All signs are available in either aluminium or corflute and all printing is UV stabilised for maximum durability. Licensed artwork is also available digitally for printing your own signs. Putting the info right where you need it most, is the aim of the caddy sticker. tell it like it is to help the community get it right every time. These beautiful stickers, make this caddy a big stick it item....NB Hide these stickers from the kids! Smaller signs to cover many of the individual recycling components you may have. A fresh look and familiar faces helps people both connect better with what they are doing and do better. Up-style your existing boring signage and start getting it noticed again. Any existing sign can be dressed up and given new life with our retro fit sticker kits. Each kit contains three transfers, two lower corner panels and a bottom connecting strip which easily trims to fit the width of your sign. These kits suit signs to 600mm in width. Longer lengths to fit wider signs are also available. Each sticker is printed on white stock for complete coverage and is UV stabilised for optimum colourfastness and durability. Landfill – Brighten things up with this happy addition to your facility. Glass – Help your community get sorted with a sign that cuts through. Recycling – Ensure many happy returns with clear signage. Organics – Feel good about doing the right thing. Metal – Clear attractive signage helps ‘good sorts’ get it right. Paint – Add some colour to your paint recovery area and get the message across. Garden Organics – Send a clear and happy message to all. Co-Mingled – Avoid any mix-ups with this easy on the eye sign. Plastic – Maximise plastic recovery and purity with a cheerful sign. Paper / Cardboard – We all need more fibre, so get this sign and help the people.